Finally Tecno has cleared the air as it once a rumor that Techno planning something big that would put smile on the customers faces. 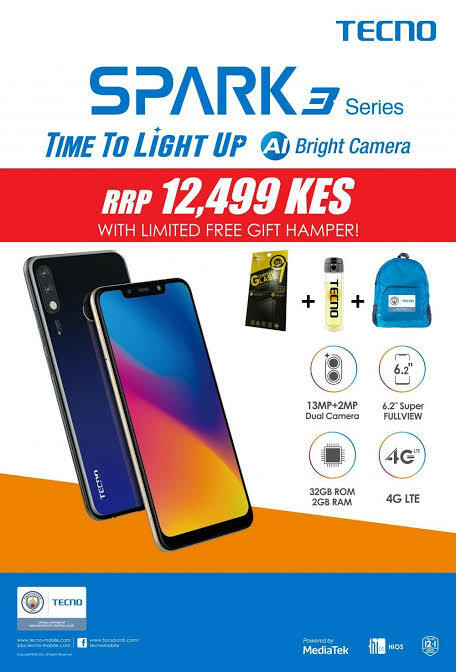 Techno launched a new smartphone series, the Spark 3, designed to help smartphone lovers to light up their dreams to achieve more. The launch took place in Lagos, Nigeria. The new smartphone, which is built with Artificial Intelligence (AI) technology, will enable users to have better picture quality with bright and clear selfies. In his welcome address, the Brand Manager, Tecno Nigeria, Mr. Luke Pan, said Tecno, having been globally adjudged as the 7th best-selling mobile phone devices in Africa, would continue to excite its customers with latest smartphone devices that are driven by AI. “We are proud to announce the release of Tecno Spark 3 series. Equipped with the latest AI technology, the success of Spark 3 is predicated to surpass that of its predecessors. Spark 3 takes photography to a whole new level as it is a by-product of rigorous research,” he added. Public Relations and Strategic Partnership Manager, Tecno Nigeria, Mr. Jesse Oguntimehin, said Tecno remained the most preferred smartphone brand because of its known factor for providing premium experiences at a price and value that appeals to the purchasing power of Nigerians. Analysing its features, Oguntimehin said the smartphone was uniquely destined and packed with amazing features that include AI Bright Camera, Smart voice assistant and high level security and privacy features, and runs on Android 9.0 Pie. According to him, it comes with the MTK 6761 Processor and a 2.0 GHz powerful Central Processing Unit (CPU) that makes for a seamless experience when interacting with the device. “With memory capacity that reaches 3268 ROM + 268 RAM, there is adequate storage space for users to get the most out of the device while enjoying its classy and trendy design. The devices feature four stylish colors Midnight Black, Champagne Gold, Bordeaux Red and Aqua Blue,” Oguntimehin said.